Before diving into the world of fish keeping, the first thing to do is look for sufficient information. The internet is awash with educative guides for first timers. At the same time, there are numerous fresh water aquarium fish species to choose from. Beginners are often advised on the best types of fish to stock that are likely to survive. Decorating an aquarium with bright and sparkling fish is a beautiful experience. Once someone begins the hobby, stopping is never an option. But of course one cannot stuff all the beauties within the same tank since they have different temperaments as well as needs. Knowing their names, needs and characteristics can help someone make informed decisions. For ease of making a perfect choice, certain fish species will be discussed below. 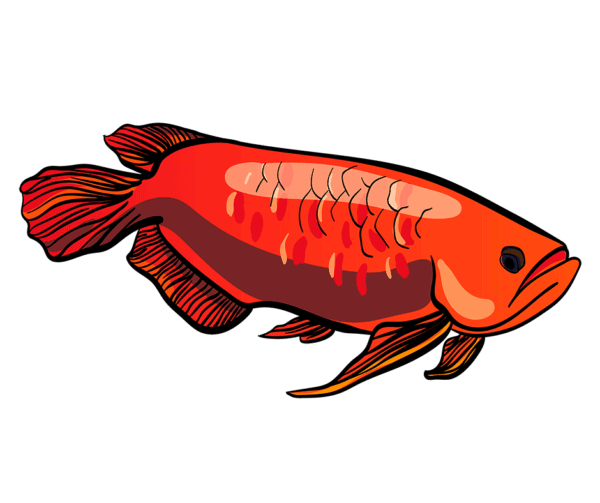 One of the most colorful fish for an aquarium is the Arowana. With the large and powerful jaws, not forgetting the razor-sharp teeth, this fish has often been compared with the dinosaur. It has a colorful brown body with silvery scales. When illuminated by light, the fish sparkles. A native of the Amazon River, this sea animal can grow up to 48 inches in the wild. In captivity however, it often measures about 30 inches under proper care. Since it is a large one, it requires a large tank of not less than 40 gallons. This allows it to find room to turn with ease. It feeds on smaller fish and other sea foods like bugs, crabs and shrimp. It also appreciates frozen foods and food pellets. Being a heavy feeder, they remove waste frequently. Proper filtration is therefore a necessity. For a more comfortable stay, the fish requires plenty of plants in the tank. A good amount of sand gravel and rocks are a necessity too. Avoid startling the fish as this may prompt it to jump sometimes even out of the tank if the lid is left open. Also referred to as the Mexican Salamander, this unique marine creature belongs to the class of amphibians. It retains its larval characteristics even when it becomes an adult. Their sizes vary with some growing to 15cm while others can be 45cm. In a tank, the Axolotl can weigh anything from 0.06 to 1kg. In the wild it obviously weighs more. Native of Mexico’s Lake Xochimilco, it is carnivorous and enjoys feeding on insects and small fish. In case it is kept with tank mates, they should be big because it has a penchant for small fish. For easy movement, the fish needs an 20 gallon tank or more. The tank should have fine sand as its skin is very sensitive. Ensure the tank conditions are right so that it stays healthy. Feeding should be taken care of as well. 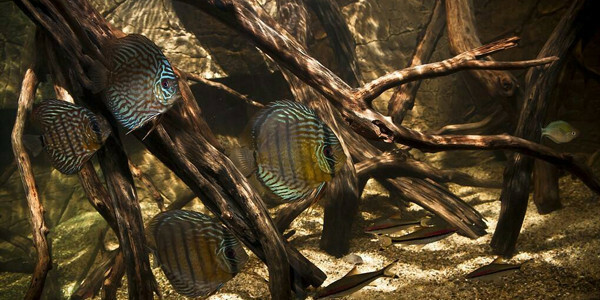 Discus fish belong to the cichlid family. They are a favorite of most hobbyists because of their uniquely bright colors. They also have circular profile hence their name. On their bodies are beautiful patterns that look even brighter when moderately illuminated. They have the capacity to grow fairly large with proper care. In fact, some can reach lengths of between 8 and 10 inches. Another reason most hobbyist keep it is because they easily recognize their owners and reach to greet them when they move closer to the tank. They are native to Amazon River Basin. Owing to the dark large stripes that cut across its body, it is also referred to as Tiger Fish. It has a wide mouth but is relatively docile. Datnoid is native of Indonesia and Thai waters. They grow fairly large and will therefore do well in a large tank. Most datnoids grow to lengths of about 65cms or more. A tank of not less than 80 gallons should be sufficient. Since it loves hiding, having bushy aquarium plants in the tank is a necessity. In its native habitat, this fresh water aquarium fish hunts. It is likely to mimic this in the tank. All the same, it is not aggressive and can be friendly to other tank-mates. Native of the Malaysia, this unique fish is another popular aquarium species for most hobbyists. It is fairly large with a beautiful array of colors. These range from pink, red, blue, yellow to orange. In between the dominant hues are dark yet beautiful markings along their profiles. Unlike other fish species, this large one is very aggressive. Owing to their size, only one can be kept in a tank. The substrate must also be well chosen so that it stays in place. Without a doubt, the tank must be enormous to accommodate this fish. Most large fish consume plenty. The flowerhorn cichlid is no exception. Being a carnivore, it has a large appetite for worms and insects. In captivity, its most favorite meals are pellets and flake foods. If well cared for, they can live for between 5 and 8 years. 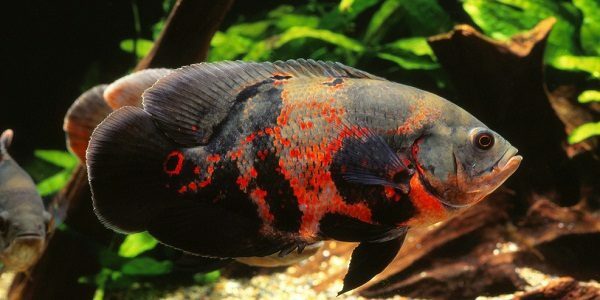 With beautiful colors to match its long form, the Malawi Cichlid can be another fresh water aquarium fish to a tank. 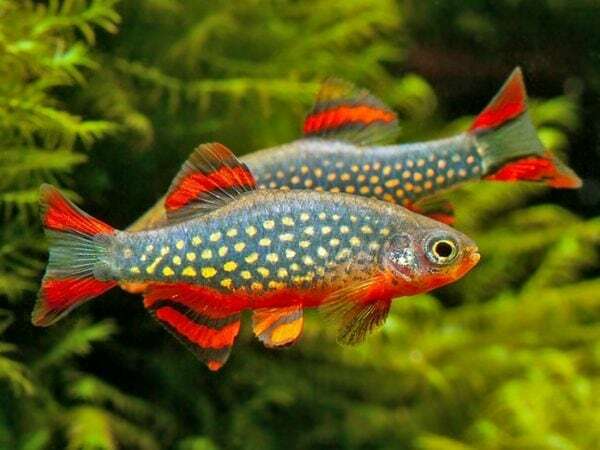 Native of Lake Malawi in Africa, this fish species has a number of requirements to keep it looking healthy and colorful. When properly cared for, the Malawi Cichlid can grow up to 12 inches. As it matures, it often undergoes dramatic changes in color. This may be quite surprising to a new aquarist. As a matter of fact, this should not be a cause for alarm. 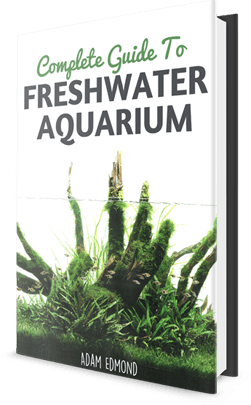 Most fish in aquariums thrive well if tank conditions are almost level with their natural environments. To ensure the Malawi Cichlid does well, the tank should be average in size. Plenty of live rocks should be incorporated to provide hiding places. Other requirements include detritus, sand and plants. The salinity of the water must be kept right. Temperatures need to be maintained as well as filtration. With an award winning name, this other cichlid family species is popular for its bright and unique colors. Native to South America, the dominant white colored fish with bold orange, red and albino patterns on the body comes in many varieties. They grow up to lengths of 10-12 inches. They therefore need enough space. A 50 gallons tank or more is sufficient as they are very playful. Being aggressive by nature, they are likely to disturb the tank arrangement, calling for proper anchorage of plants and rocks therein. They are primarily carnivorous. Smaller fish should not be kept in the same tank as these can be easily turned to sumptuous meals. Since they are aggressive too, the onus is to keep them with same cichlid species. For pet lovers, fish can be a good idea for the home. Good news is that they remain in their tanks and will thrive so long as their requirements are met. 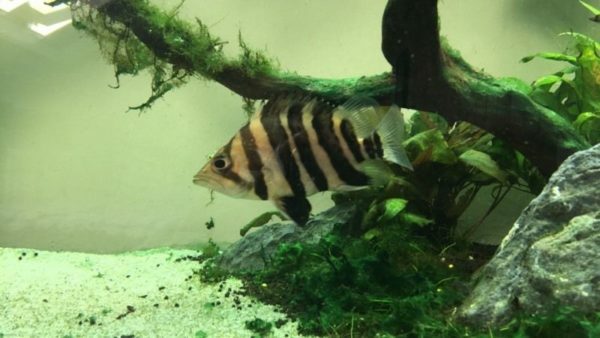 When thinking of fresh water aquarium fish, the above mentioned may be a perfect consideration.